A rendering of the Cornell/Technion proposed engineering and applied science campus for Roosevelt Island. 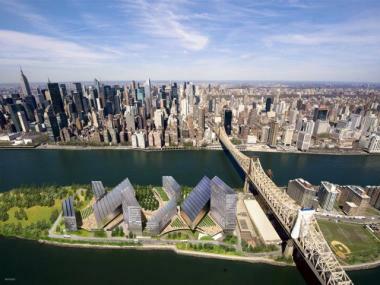 MANHATTAN — As Cornell and Stanford duke it out over the city’s bid to build a major engineering and applied-science campus on Roosevelt Island, both schools are touting their eco-friendly design plans. Cornell, which last week announced it was teaming up with the Israeli heavyweight Technion, proposes to erect the largest net-zero energy building — one that creates as much energy as it consumes — in the eastern U.S. on Roosevelt Island, school officials announced. The Cornell/Technion proposal’s main 150,000-square-foot building would be oriented toward the sun’s arc to capture solar power to generate up to 1.8 megawatts a day — enough to supply 1,400 American homes. The school would also use thermal power, tapping into the earth’s heat with a 4-acre geothermal field of 400 wells, for an additional energy source, officials explained. The university partnered with Distributed Sun on the project, a Washington, D.C.-based solar energy development company founded by a Cornell alumnus. The campus would also have rain gardens, community gardens and green walls. Its faculty and students would be able to use the campus as part of its curriculum, doing research to integrate updated technology, officials said. Stanford, which recently announced it was partnering with the City University of New York (CUNY), also plans to up the green ante by creating a Roosevelt Island campus that would use 50 percent less energy than a level that is already considered efficient. The Palo Alto, Calif.-based university would also create a marsh to filter water runoff, as well as recycling water from sinks and perhaps toilets, school officials told The New York Times. Like Cornell, it would tap into the earth’s high temperatures by using ground-source heat pumps, according to the Times. “This proposed campus goes beyond buildings and reduced energy use — it's a living laboratory that brilliantly anticipates and integrates forward-thinking design and building technologies,” Kleinman said in a statement. Laura Goldstein, Stanford’s director of project management, told the Times that the "new campus is a big opportunity to look at campus-wide systems, to showcase technologies." The universities are heading into the final stretch to complete their proposals before the Oct. 28 deadline for the city’s bid, which comes with up to $100 million in infrastructure improvements. Other schools are eyeing spots beyond Roosevelt Island, including Columbia, which is already expanding its campus into Manhattanville; Carnegie Mellon, which is looking at the Brooklyn Navy Yard; and NYU, which wants to move into Downtown Brooklyn. But East Side elected officials, who hope the soon-to-be emptied Goldwater Hospital will be transformed into a graduate school campus, have touted how Roosevelt Island has become a petri dish for green technology. Besides its complex system of underground pneumatic tubes that whisk trash away rather than have garbage trucks clutter up the island, there are also underwater turbines in the East River powering a parking lot and supermarket, as well as parking sensors helping residents to find empty spaces.